A visit with Persis and Lydia! You are here: Home / Friendship / A visit with Persis and Lydia! If I had to pick one word to describe how I feel tonight, it would be joyful! Why? Because Persis and Lydia came to NYC! Despite all of its challenges and potential dangers, technology, if used for the glory God, can be a tremendous blessing. I thank God for the saints I have met on line. It encourages me to know that I have brothers and sisters around the world who are fighting the same fight of faith. I am especially thankful tonight for the opportunity to meet my friend Persis at Tried by Fire, and her beautiful daughter Lydia. We met on the corner of 34th street and 8th Avenue, just 15 minutes before her bus was scheduled to depart. We hugged each other, exchanged gifts and chatted a little. I met her beautiful sister and nephew, too! This is a picture of us. If we look cold, it is because we were! 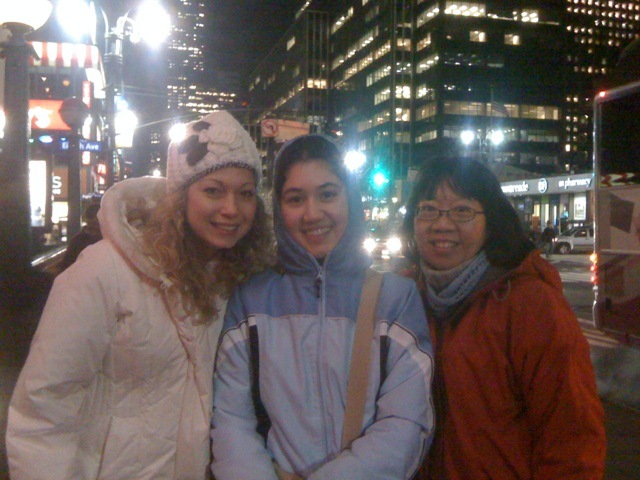 Christina, Lydia, and Persis in NYC! Lydia is every bit as delightful as she looks in this picture! She is a special young woman whose countenance shines with the joy of the Lord, and upon whom the grace of God is so evident. These are my gifts. Persis gave me a copy of Sinclair Ferguson’s “By Grace Alone” and also made this beautiful bookmark for me. If you look closely you can see a picture of Octavius Winslow. Having sent me an email earlier in the week, she wanted to know who my favorite dead theologian was and what my favorite color was. She’s a clever one, that Persis! "By Grace Alone" by Sinclair Ferguson and a handmade Octavius Winslow bookmark! And so our visit, albeit brief, was very sweet. Tonight I thank God for the gift of my sisters Persis and Lydia! WOW! I am so excited to see this picture; to see faces; to see you! What an incredible gift from above! Love you, Christina and Persis! We had a wonderful time Becky and next time you are in NYC we have to plan better…that is, if we don’t get to Mexico first! Love and blessings to you, too!!! I love this! What a blessing you all are to each other….God is so good and He has such beautiful and amazing daughters in you girls. I am so happy for you Christina! What a wonderful gift. I wish we could all meet…and we will one day!! Blessings! How wonderful will that be Petra! Amen! I’m so glad the Lord gave us this opportunity. Lord willing, He will grant us a longer one next time. The tulips survived the bus ride. Oh, what joy!!! Sometime, Lord willing, that will Emily and I standing with you on a street corner in NYC. How wonderful-I am going to get to meet Persis sometime too! Thank you Christina for sharing the pictures. The Bible tells us to confess our sins one to another and I must confess – I’m JEALOUS that I couldn’t be there to meet all of you! What a beautiful picture Christina! I’m so glad you all got to meet. Perhaps the Lord will grant us the blessing of meeting more of our blogger friends this side of glory. Becky and I have been trying to scheme a way for a blogger’s get together some how. Yes, Trisha! I DO love the bookmark! It is so pretty yet so practical!! !